Welcome to the Living Room! We aimed for a cool, natural, relaxing environment with color accents to tie the water in, as well as some touches of gold. 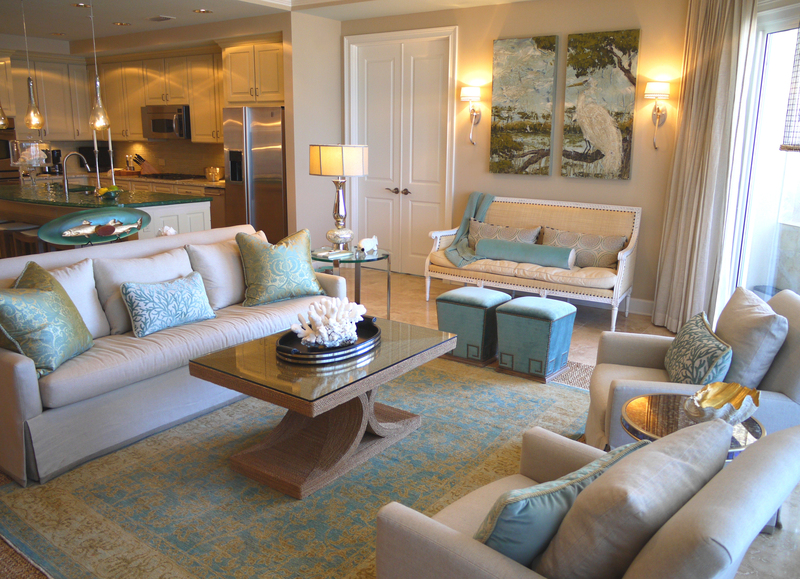 This large sectional provided some sophisticated and inviting seating to this large living area. 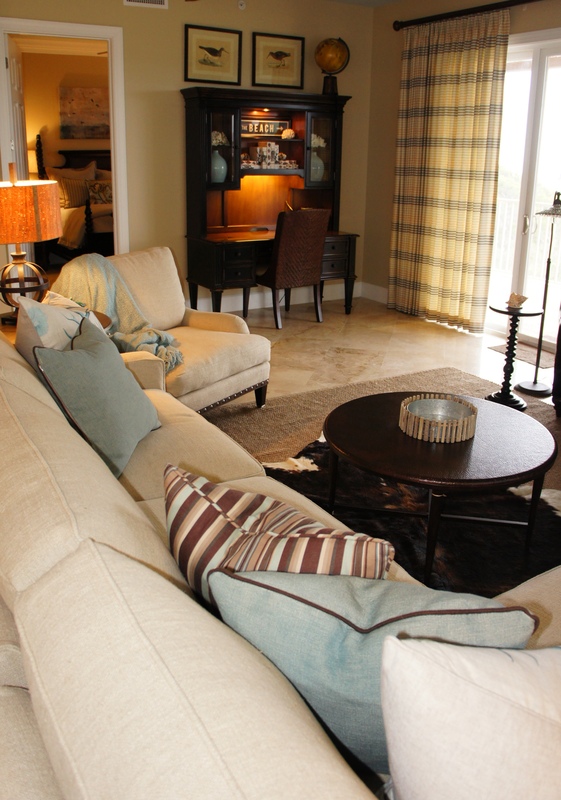 We layered a plush blue wool area rug on top of a large woven jute. The oval white-shell top cocktail table by Oly was the perfect size and shape for the arrangement. We anchored the lounge area with a large cow hide. 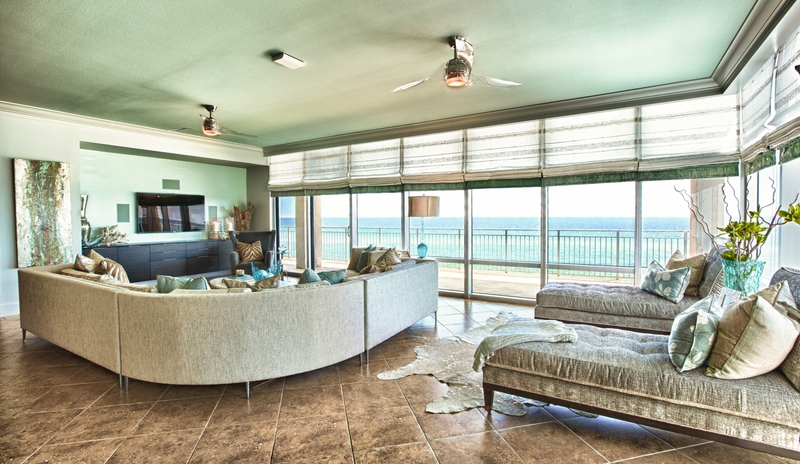 In the media niche, we built a floating modern console on a backdrop of a green painted accent wall. 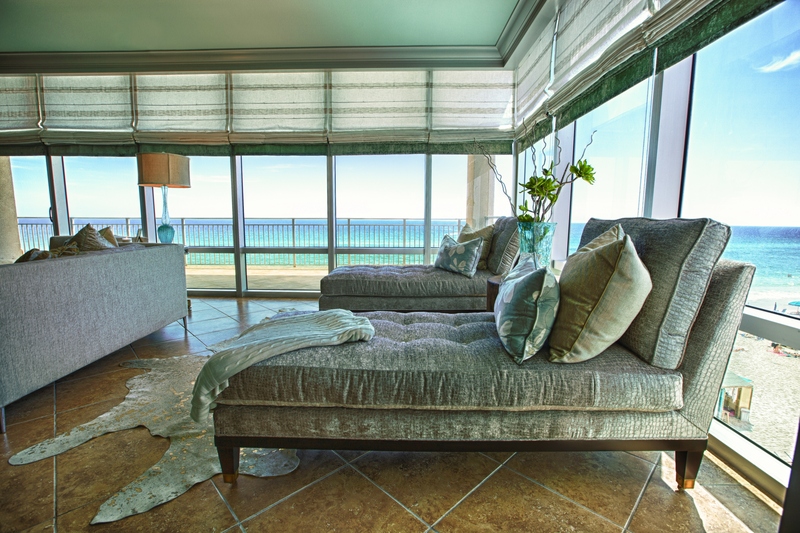 Two Century chaise lounges add some “swag” to this sitting area. 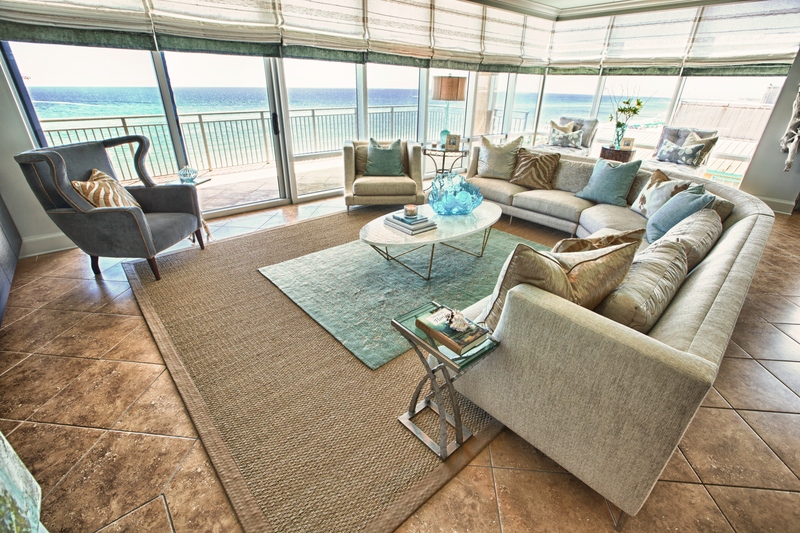 Plush gray croc chenille fabric worked great juxtaposed against the blue and white beach! This corner is cozy with its Century Furniture contemporary wing chair, covered in a charcoal velvet and shimmering gold linen welt. 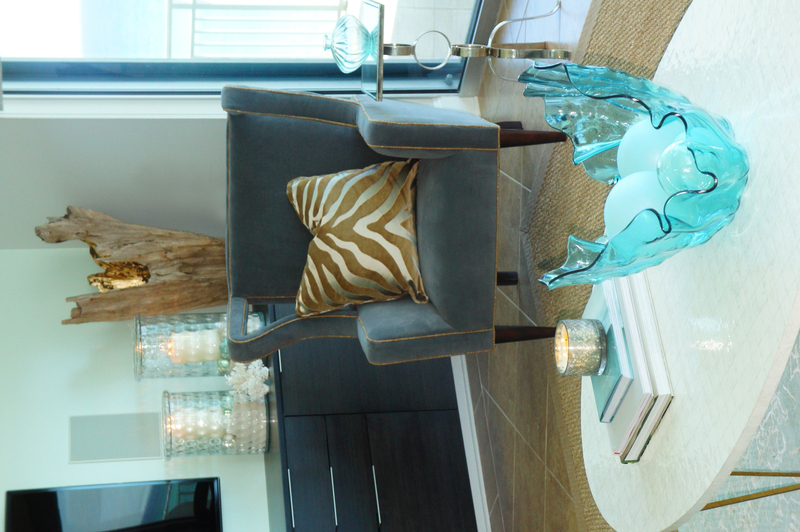 The gold velvet zebra pillow and glowing gold of the driftwood sculpture, along with the candle light radiate nicely out from all the gray and green. 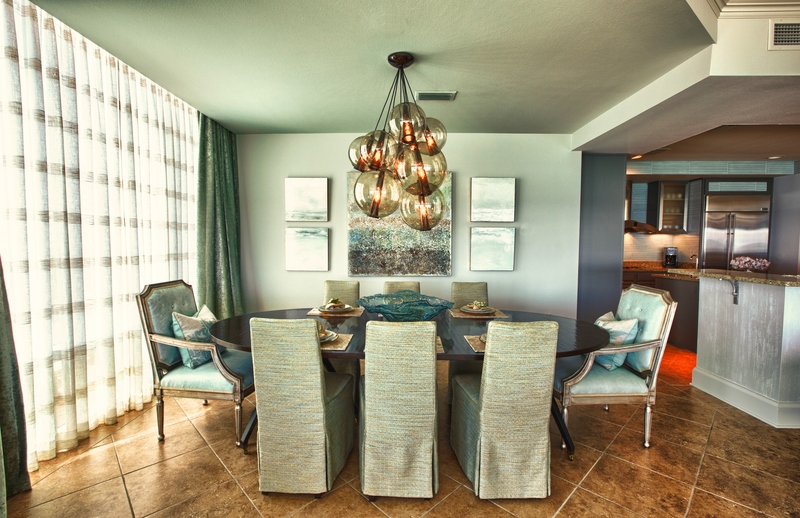 We defined the Dining Area with a large oval dining table and fabulous Caviar chandelier by Arteriors. 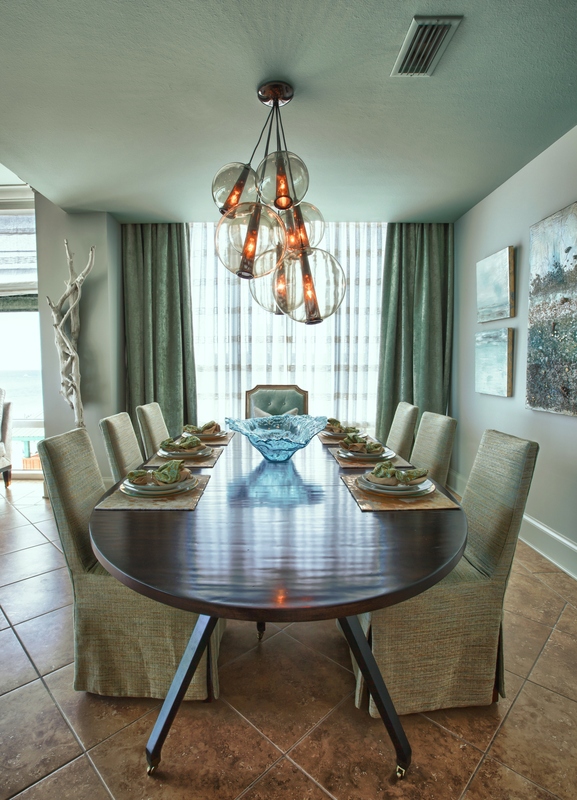 The chairs are slipcovered in a green textured linen, and the host chairs are upholstered in a fresh pale aqua leather! 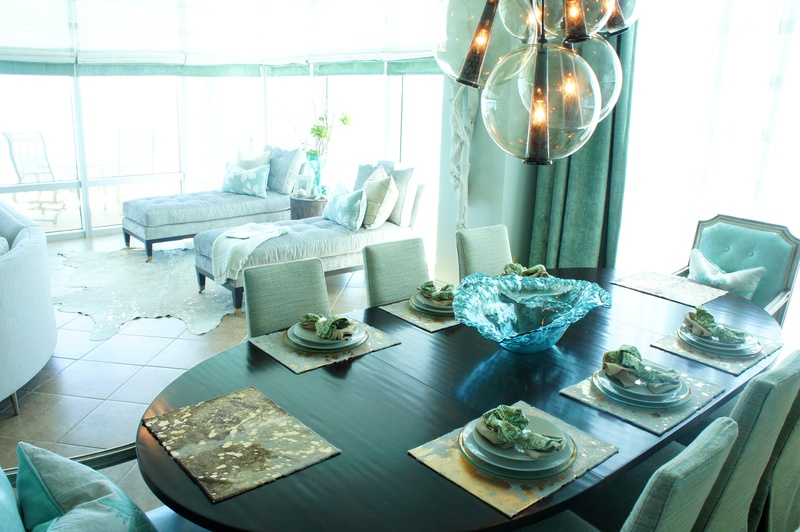 The drapes and sheers give this area intimacy and drama! 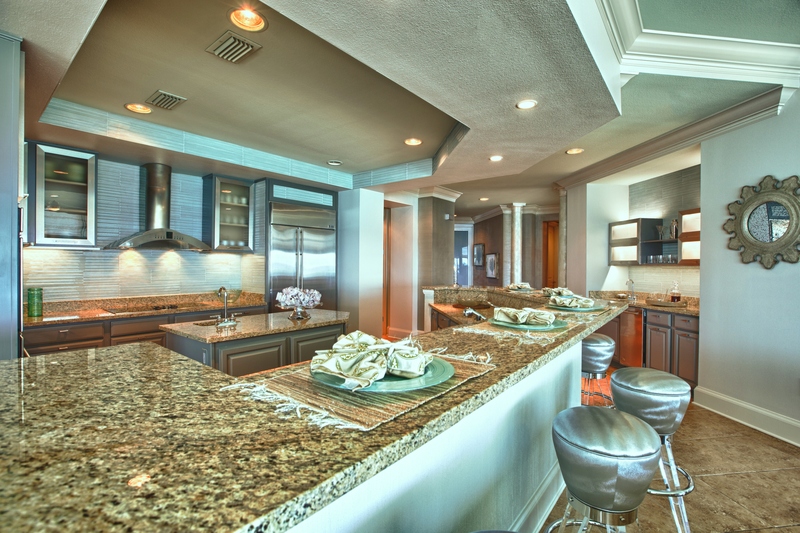 This shows an overall view of our remodeled kitchen and wet bar! We gave the cabinetry a facelift by removing the upper doors and replacing them with stainless steel-framed glass doors. The rest of the cabinet doors and bases were painted a warm gray. 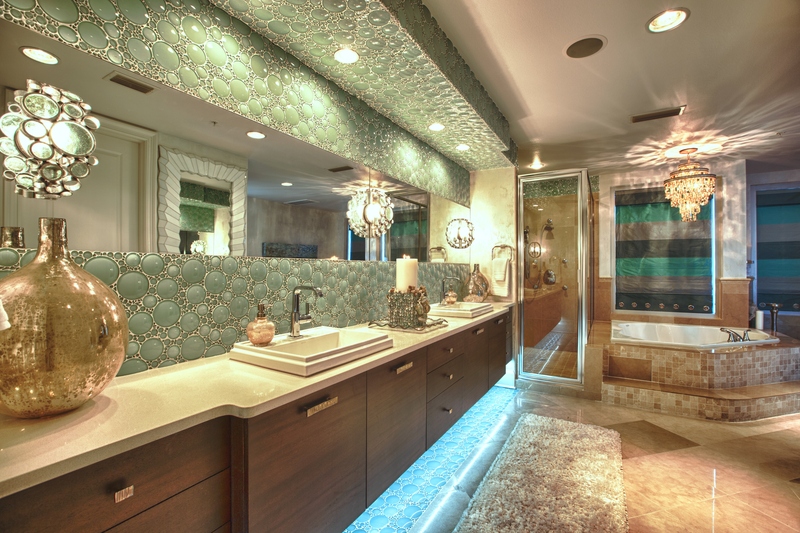 The backsplash was uplifted with the pale aqua horizontal glass tiles, which were repeated on the vertical portion of the tray ceiling. 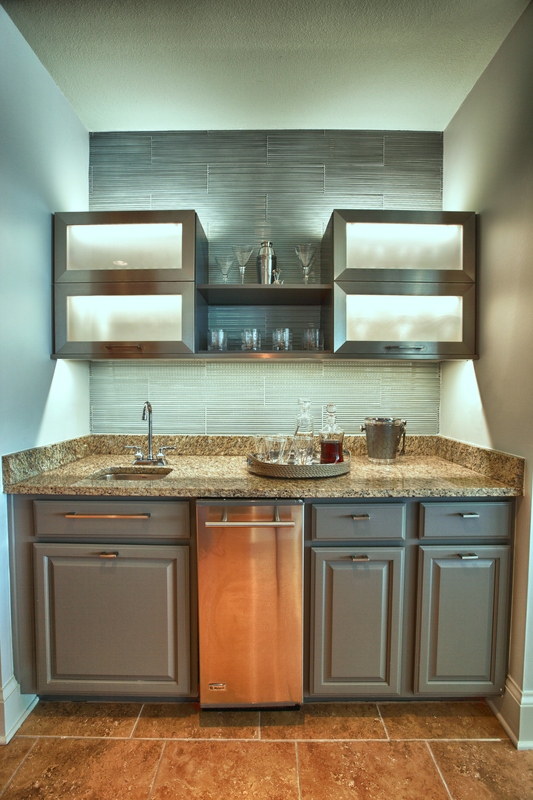 The upper cabinets above the wet bar were removed and replaced with these contemporary stainless steel-framed cabinets and shelves. The l.e.d. 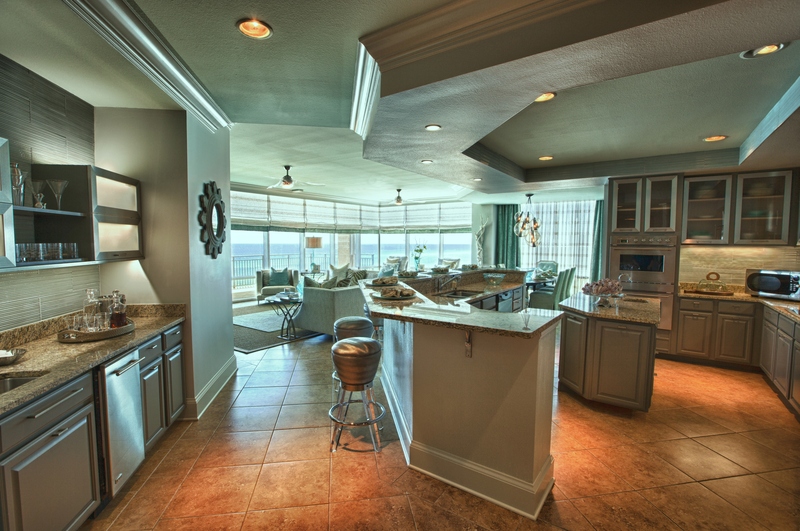 lighting helps to accent the new, fresh tile. 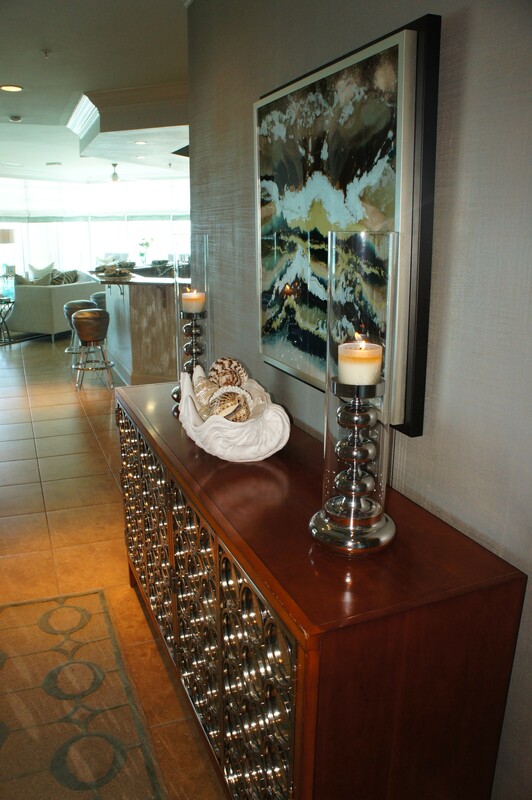 This entry console was the only original piece of furniture we kept by the end of the remodel. We think we breathed in it some new life here! 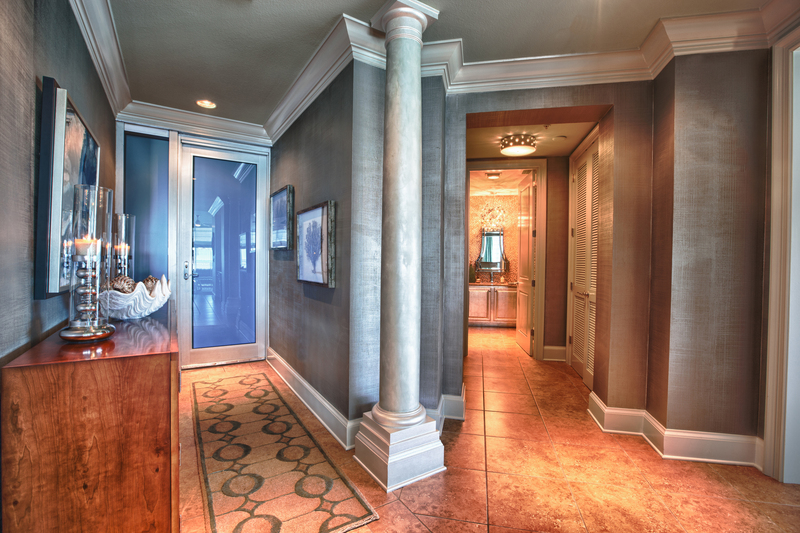 This shot allows you to see the Entry and Powder Bath entrance. 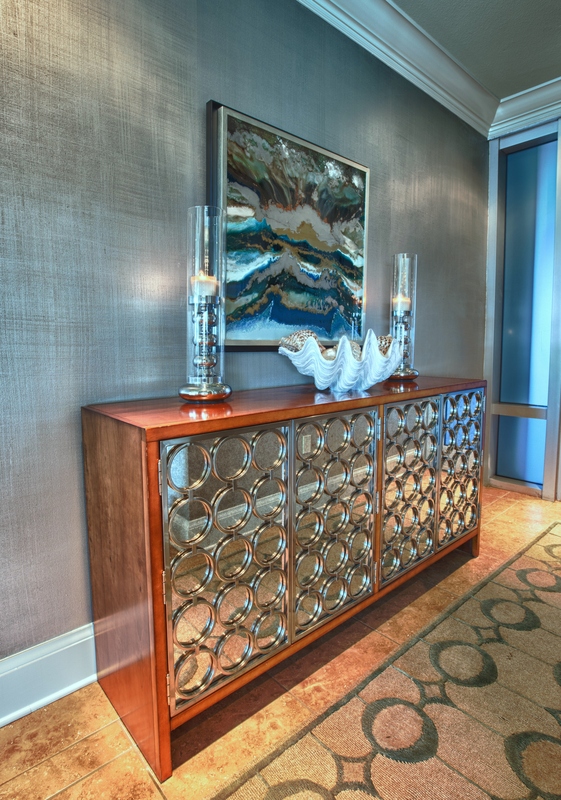 The walls here are a silver linen textured faux finish, and the columns were given a pearlescent finish. 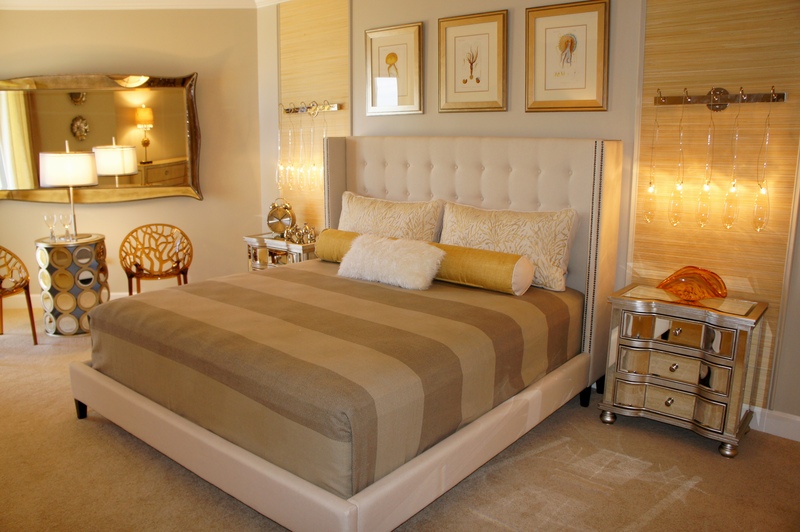 This room definitely makes a statement, with its grand cream leather king bed, whose lightness is emerging out from the almost 3-D faux finish on the walls. Thank you, Krista and Cindy with Ufauxrea for all the wonderful work you do for us! This bed wall finish is a soft charcoal geometric pattern, with highlights in glass beads that help to create the illusion of depth. 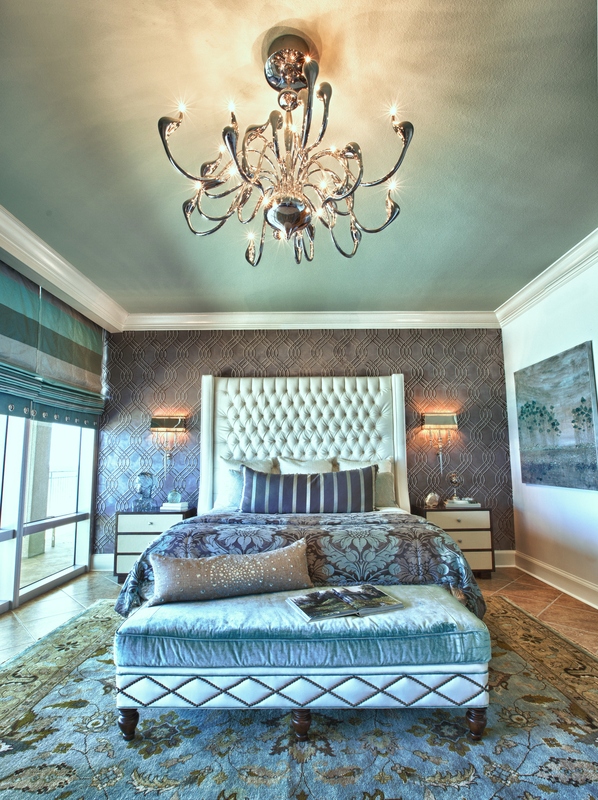 The chrome chandelier adds some excitement to the room, while the traditional rug and beautiful damask foot blanket help to ground the design for a more transitional feel. The Swan chandelier by PLC Lighting provided the perfect touch of uniqueness and “bling”! At 42″ round, it definitely made a statement! 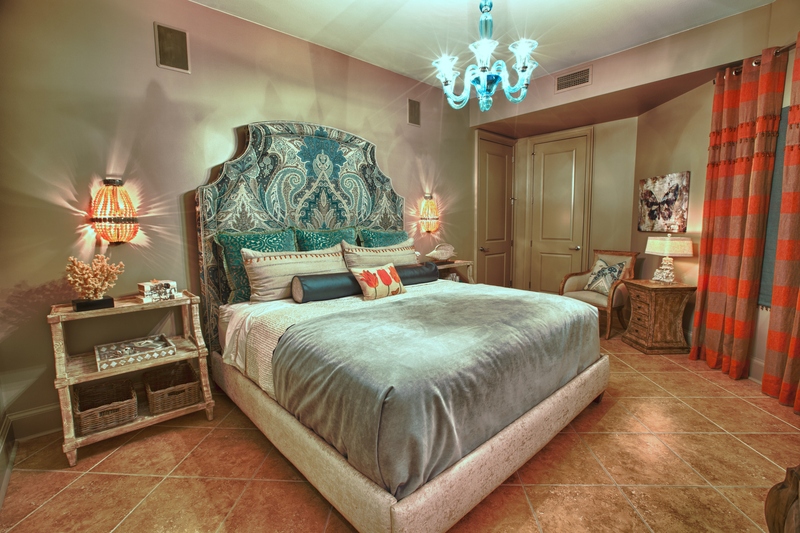 This stately bed is a custom bed by Mario & Marielena. The bench is by Drexel Heritage and the bedding is all custom. To update this bathroom, we completely gutted the vanity area, but left the shower and tub area as-is, except for the fabulous tub chandelier and beautiful window treatments! Rather than match the existing travertine underneath the cabinets, where the old cabinets were removed, we ran the green glass tiles down below. This helped reinforce the floating effect we were going for! 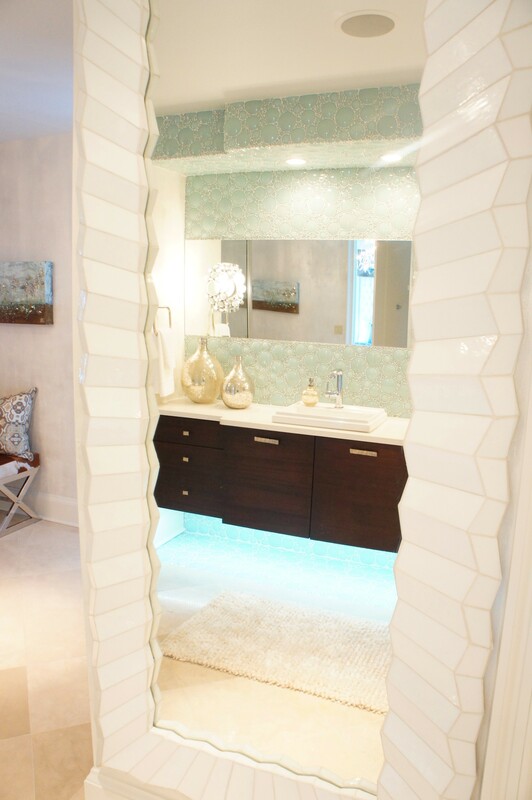 The three bubble glass sconces were ideal, and looked as if they were meant for exactly this bathroom! The old cabinetry was removed and replaced with this floating double vanity. 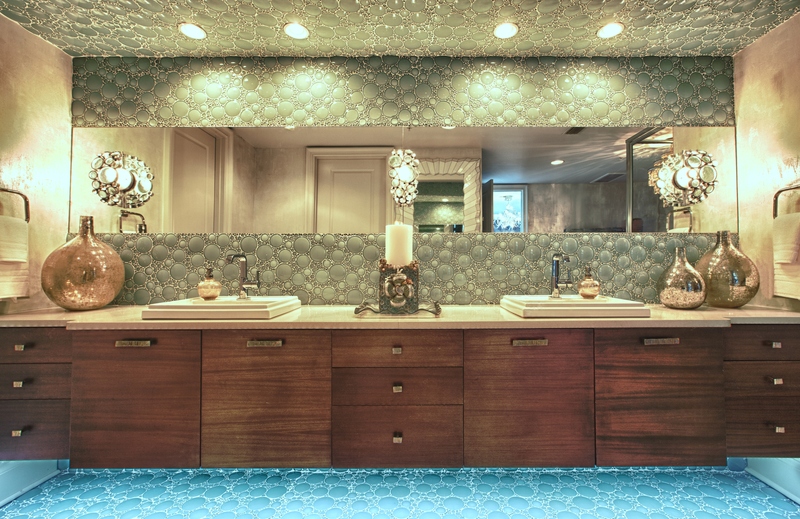 The green glass bubble tiles on the backsplash are divided by one long horizon mirror at eye level. 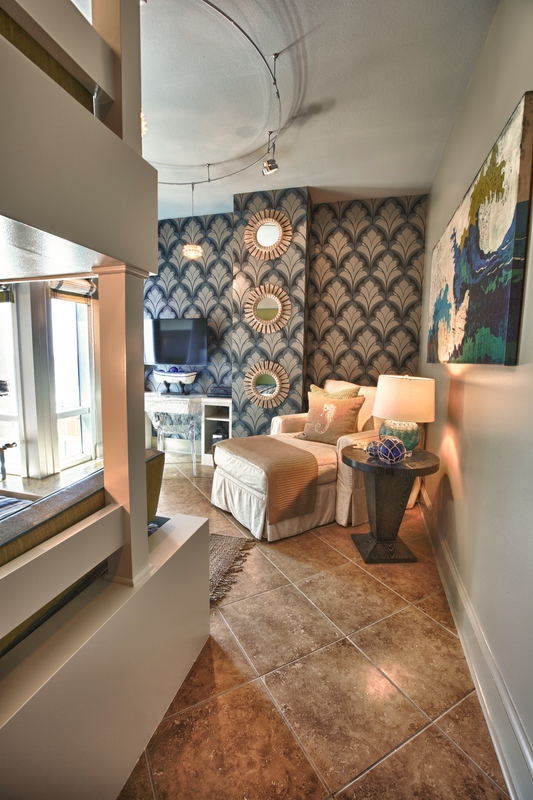 This blue printed wallcovering brought weight and emphasis to the other side of the room. It was the perfect backdrop for the chaise lounge and white built-in desk. 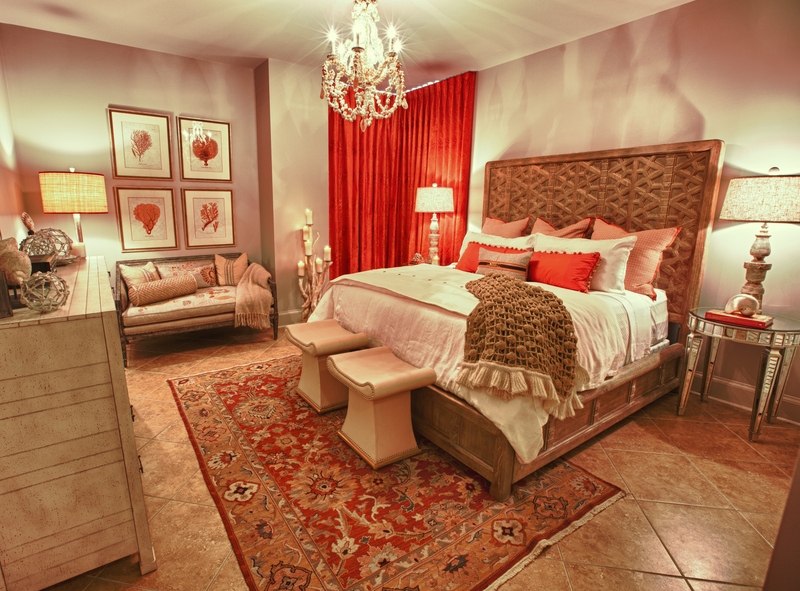 This room is calm and natural, with warm glowing pops of coral. 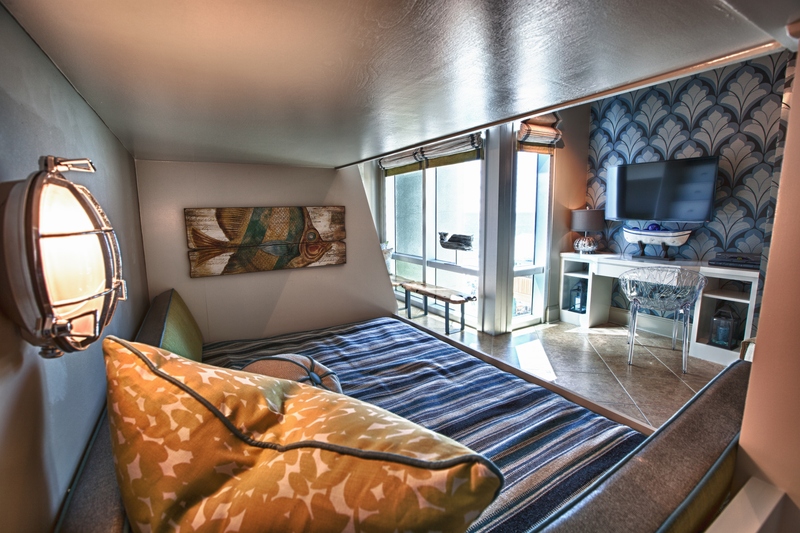 In the corner, we created a cozy nook with a plush settee underneath a set of four framed hand-colored prints. 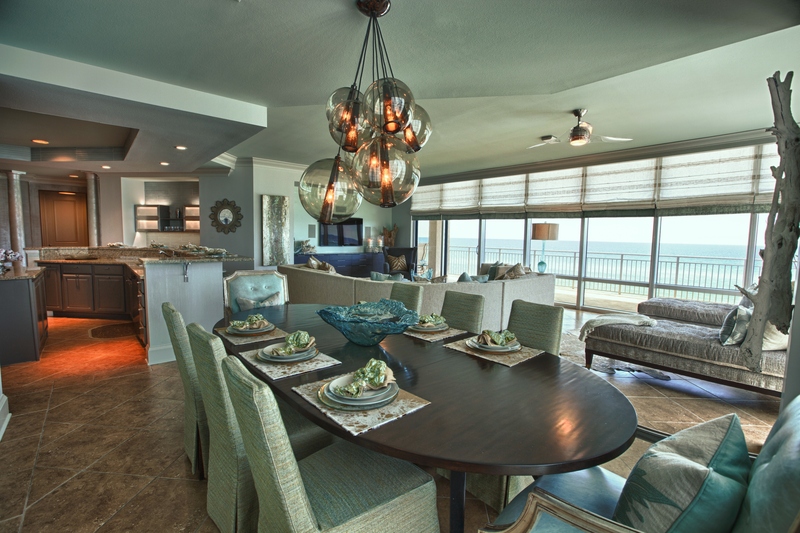 The shell chandelier by Currey Company adds a beautiful touch of coastal. 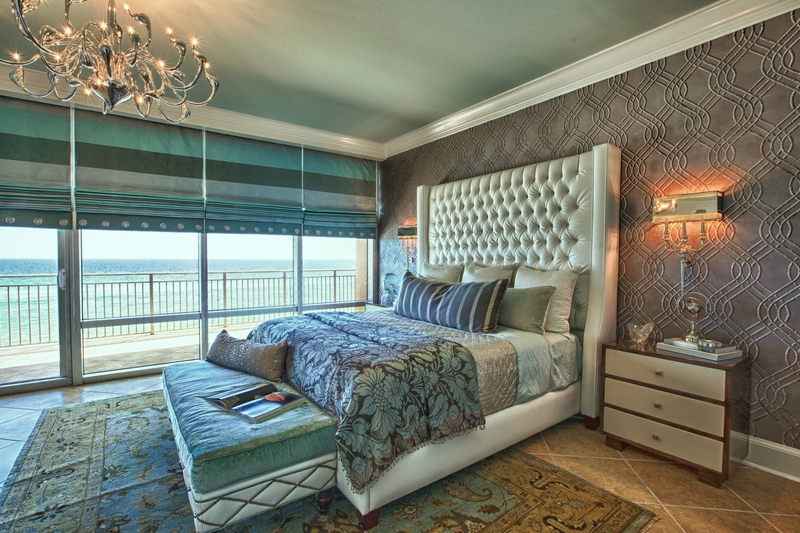 This guest room was furnished with a tall bed, upholstered in a gorgeous Schumacher fabric. 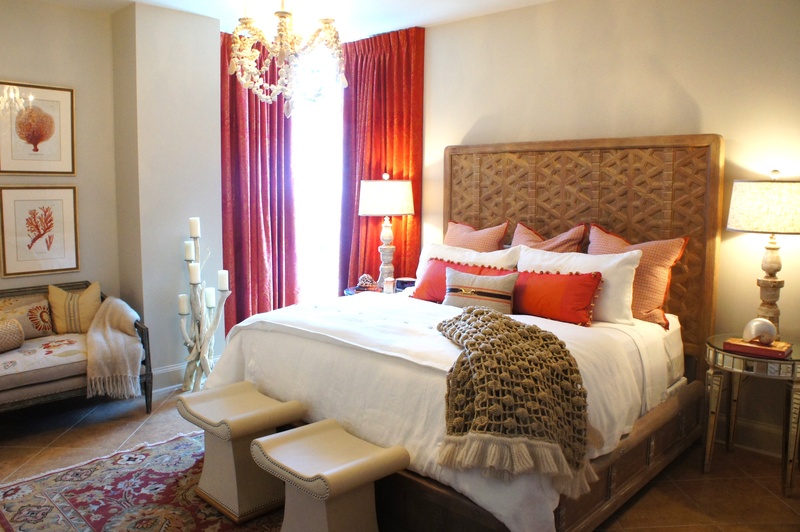 Bedside shelves and apricot beaded sconces finish off the bed wall. 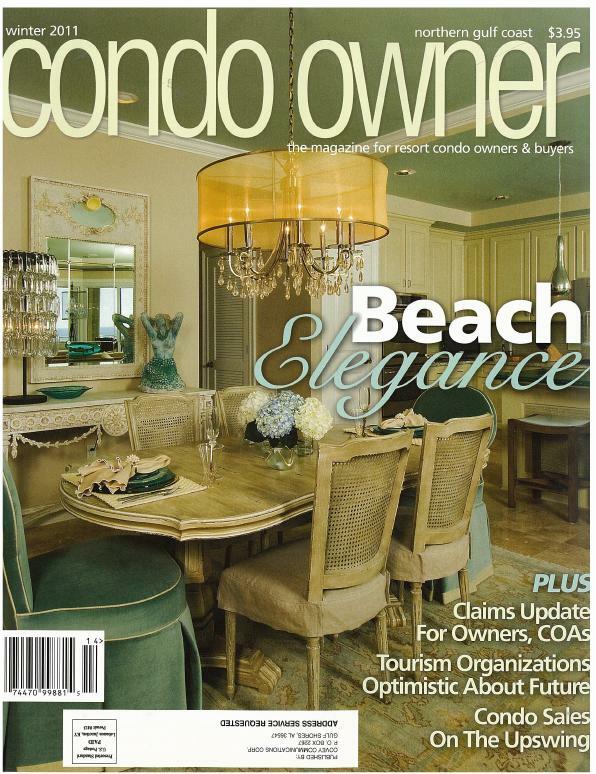 Contact me if you are in need of a designer to help you renovate and update your home! The is awesome!! Good job Joey and Cara! Fantastic, as always Cara. Just love it…you are so talented. I wish I lived near you …or you in NY – I would help you with your faux finishes. I have a question – do you have a fabric co. that makes or sells soundproff fabric for media rooms? I have a client who would like to investigate using this in their media space in their basement – they want to have draperies surrounding the space to make it darker and to soundproof it as well. of course – all in a tight budget!! Let me know if you have a source! I do not have an easy source I can give you for a sound-proofing fabric off-hand. I know there are sources out there for sound-proofing fabrics meant for wall panels in theater rooms, auditoriums, etc. (try Audimute) That looks more commercial, however. I will say that wall-to-wall drapes will definitely help! Use fabrics that are heavy, textured and plush, as they will absorb more sound. A Velvet would work great. 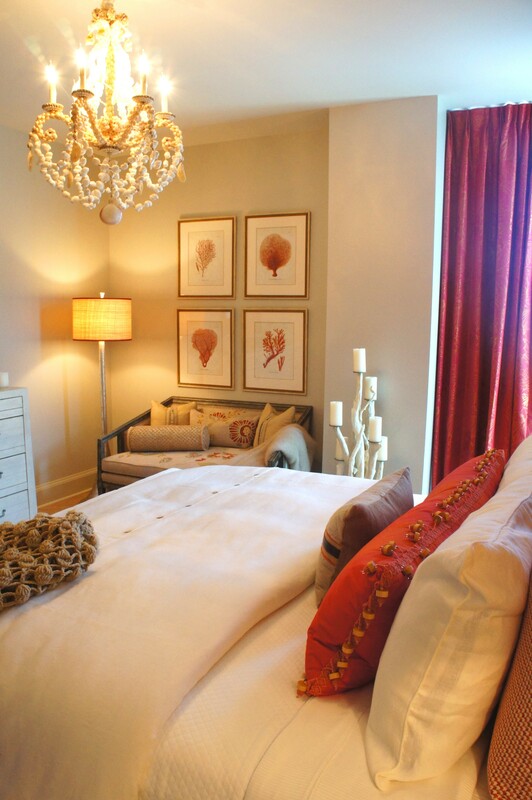 Make sure to line & interline the drapes for extra absorption and for a fuller, richer-looking drape! 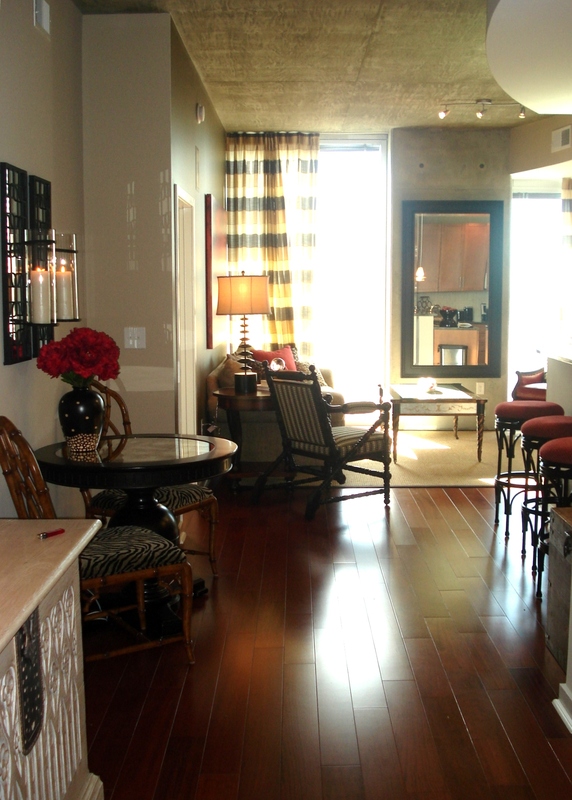 Also, they will want to use carpeting, or at least some layered, plush rugs. 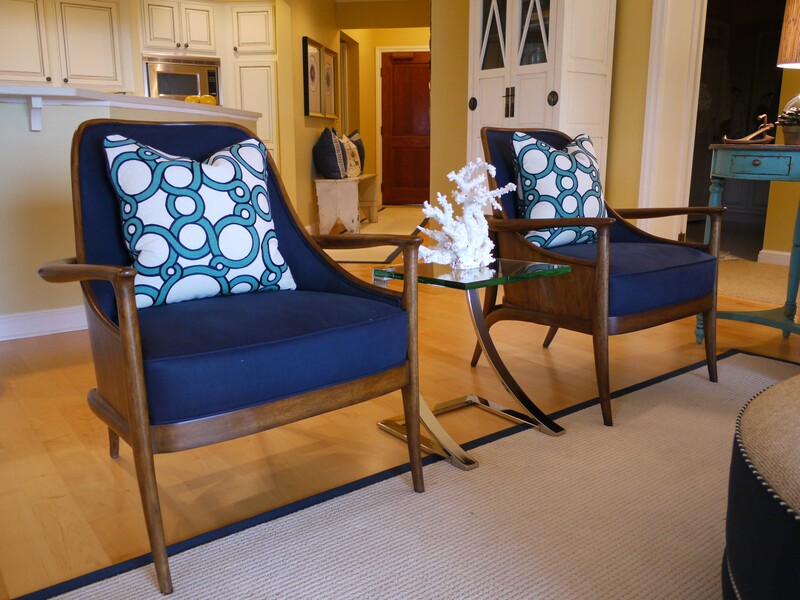 Choose plush fabrics on the furniture, rather than leather. 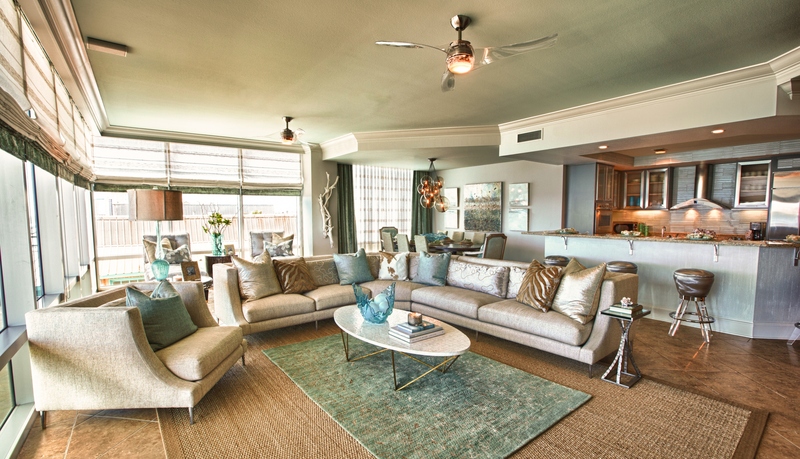 In areas where you can’t do wall-to-wall drapes, try doing upholstered & padded panels on the wall. (Having a local fabricator make them, like they would for a headboard will look a lot less commercial than those Audimute hard panels.) You can do it in a grid pattern for a modern look, or trim it out like wainscoting for a transitional look. This might save on fabric yardage–plus, the padding & foam used to upholster the panel will help in sound proofing. Thanks so much Cara – I appreciate it! You echoed my sentiments exactly. 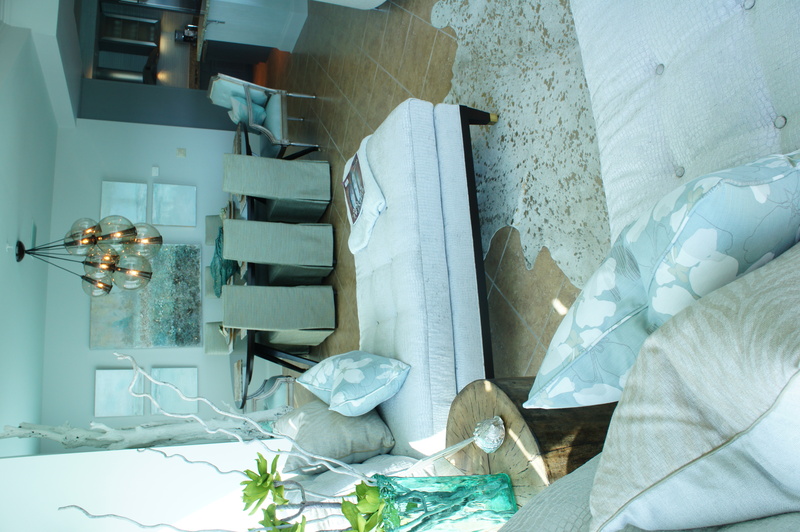 I didn’t want ths space to look commercial – just homey and inviting! Plush fabrics will do the trick. 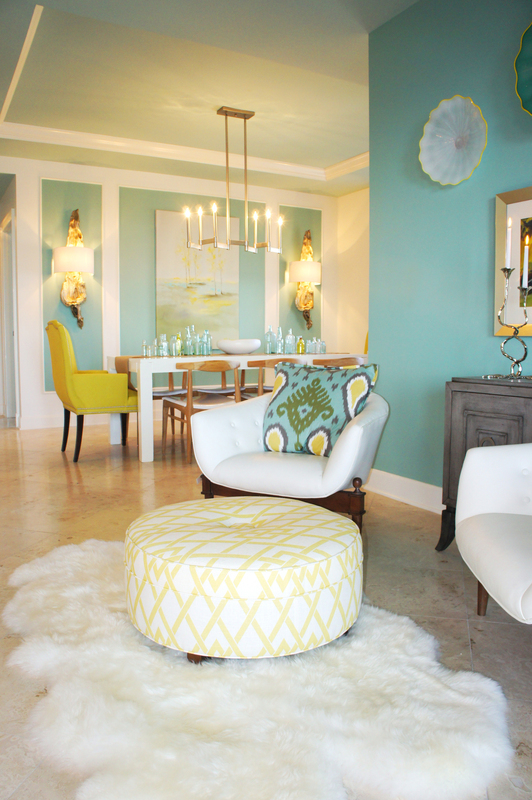 Love everything about the design and the color scheme for each room. I was wondering what paint color was used in the kids room. 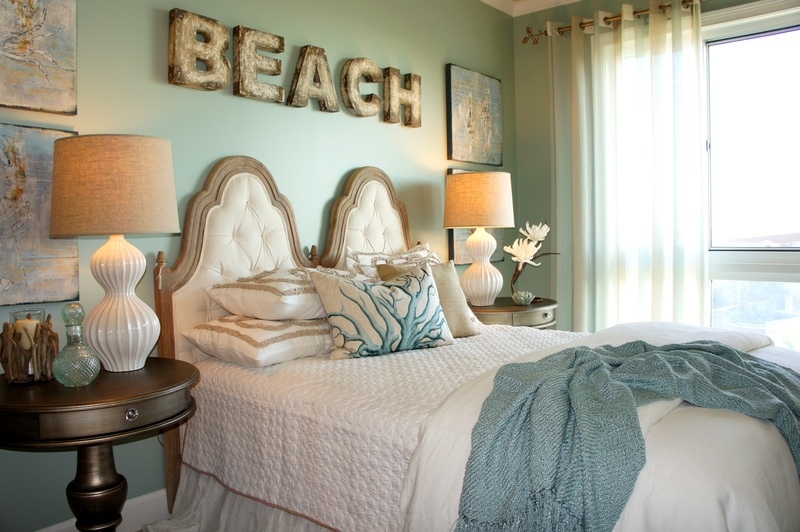 I’ve been looking for neutral that ties in nicely with blues and this is it! Sure! It’s called Revere Pewter, and it is by Benjamin Moore. It is a wonderful warm gray that I use a lot! Is there any way to get the plans for the bunk beds? I have looked high and low for good plans (and am willing to pay for them) but this is the design I really like best! Thanks! I love the bunk bed and am in the same position.